Why More Than A Smile? A common question received by our Erie County, NY, orthodontist is, “Should I bring my child to an orthodontist?” The short answer is YES. The American Association of Orthodontists recommends that every child receive an early evaluation by a trained orthodontist at the age of 7. Since many early warning signs can only be recognized with x-rays and the eye of an experienced jaw specialist, taking the time to have your child evaluated can help to avoid later complications such as adult tooth extractions and extensive braces. 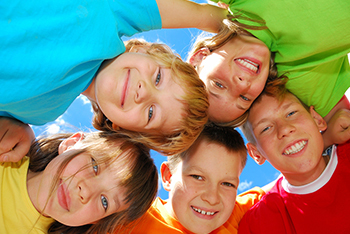 When Should You Bring Your Child to Our Erie County, NY, Orthodontist? A regularly scheduled checkup from your family or pediatric dentist can often identify problems with your child’s teeth that you might not notice on a day-to-day basis, according to our Erie County, NY, orthodontist. For example, while the natural growth and development of teeth are different in every child, your dentist appropriately tracks the irregular loss of baby teeth, or identifies the incorrect alignment of incoming teeth. Our orthodontist in Erie County, NY, advises that these conditions sometimes lead to an improper bite, potentially causing future orthodontic problems for your child. In addition, early signs of teeth grinding in your child are another reason why your dentist may refer you to an orthodontic specialist. Our Erie County, NY, orthodontist knows that dental issues can cause headaches or jaw pain in some patients. For example, chewing food with an abnormal bite may cause your child to continuously overuse muscles in the jaw, head, or neck. Your child may also experience a popping sensation or have jaw pain when the mouth is open. After consulting your family doctor, contact our Erie County orthodontist if your child has persistent headaches or jaw pain. Teeth appear crooked, overcrowded, or unevenly spaced in your child’s mouth. You notice that your child has an overbite, which is when the top front teeth stick out too far over the bottom teeth. Your child appears to have an underbite, or the lower front teeth are out in front of the upper row of teeth. Persistent thumb sucking in your child, which can affect proper teeth placement and alignment. Our orthodontist in often hears from parents worried that their child’s thumb-sucking habit will cause additional long-term teeth problems. Your child’s lips do not close comfortably, even when the face is at rest or has a relaxed expression. If you have concerns about these or any other issues as your child’s teeth develop, don’t wait to schedule an initial exam and consultation with an orthodontist at More Than A Smile Orthodontics. At More Than A Smile Orthodontics, we strive to provide a consultative approach for every patient. We want you to fully understand your treatment options before any work has begun, so you are confident in your choice in your treatment and your choice in our practice. When you are ready to learn more about your or your child’s smile transformation, call 716.633.4747 or click here. We can’t wait to welcome you as a member of the More Than A Smile family. This information is not meant as medical advice. It is provided solely for education. Our orthodontic office in Erie County, NY, would be pleased to discuss your unique circumstances and needs as they relate to these topics. Feel free to give us a call at 716.633.4747 or click here to schedule a complimentary exam and consultation with our More Than A Smile orthodontist. "We have had an extremely positive experience at More Than A Smile Orthodontics. The combination of an enthusiastic staff, knowledgeable assistants and experienced and compassionate doctors, makes for great treatment - both for the patient and the parents, too! "- Suzanne S.
"Two of our children are patients at More than a Smile. The entire staff is friendly and always available to answer questions and help in any way needed. They offer compassionate care. Emergency appointments are made very quickly which is evidence to how they treat their patients. I would recommend them to anyone needing orthodontic care. Our kids have had zero anxiety because of how wonderful their experience has been. "- Kate V.
"From the beginning and throughout the process, the providers take the time to explain the treatment plan well to both the parents and children. The office staff is welcoming and appointments always run on time. The contests and point system keeps the kids motivated. The end results are beautiful! "- Dan W.
"I have been very happy with the treatment my family has received from More Than a Smile Orthodontics. The staff is friendly, accommodating to our hectic schedules, and always willing to take the time to answer my questions. I am a former patient, and when it came time to choose an orthodontist for my own children's braces, I did not think twice about bringing them to More Than a Smile. "- Kelly S.
The award-winning Williamsville NY Orthodontist, Elma NY Orthodontist and Orchard Park NY Orthodontist of More Than a Smile Orthodontics offers the most advanced orthodontic care for children and adults. Our treatment options include braces, clear braces, Invisalign, Invisalign Teen, Damon braces, AcceleDent, early orthodontic treatment for children and more. Come experience More Than a Smile Orthodontics! You will quickly discover that we offer state-of-the-art and affordable Invisalign and braces in Williamsville, NY, Elma, NY, Orchard Park, NY, Amherst, NY, Clarence, NY, Tonawanda, NY, Hamburg, NY, East Aurora, NY, Lancaster, NY, Buffalo, NY and West Seneca, NY – and we do it with a smile. We’re ready to help you achieve a healthy smile in less time! Call 716.633.4747 today to schedule your appointment with our orthodontist at one of our conveniently located orthodontic offices in Williamsville, NY, Elma, NY or Orchard Park, NY.